Even moreso that Kata, the eating in Karon firmly caters to tourists and few places stand out from the crowd. Prices are inflated. 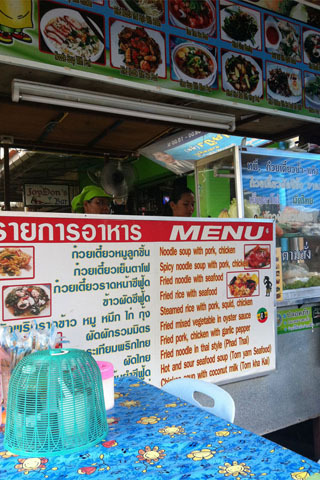 On the left you’ll find pork and chicken satay, som tam, kai yaang and a few bbq meats while on the right these is a small rice and noodle joint that even has an English menu. For Thai staples this bunch of places is the cheapest food in the area and is just as good as what you’ll pay twice as much for in one of the nearby restaurants.... Read our full review of Thai food stalls. Serving superior traditional food at a decidedly high price tags, Old Siam is a good spot for an evening special occassion if you’re wanting to stay in the Karon area and don’t mind eating within a large resort. Make sure your wallet is well stocked — simple curries start at 400B. Open at 18:00 for dinner only.... Read our full review of Old Siam Restaurant. 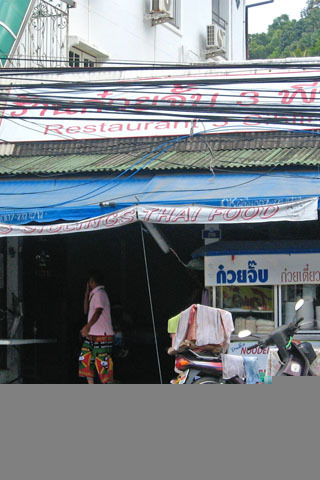 A popular streetfront restaurant with local prices, the family who runs the restaurant brings a massive truck load of fresh vegetables every morning to suit the demands of their lunch and dinner customers for Thai curries, rice dishes and soups. With most dishes starting at 50B this is a good budget option for lunch or dinner. Escape the inflated beachside prices and relax at their simple... Read our full review of Restaurant 3 Siblings. It won’t win any decor awards, but the food it reasonable and the service prompt. 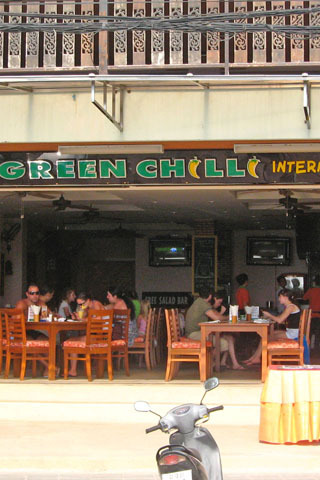 Green Chili cooks up Thai and international food at fairly friendly prices — with food and drink happy hour specials to boot. Jugs of draught Chang beer are 120B all day and from 14:00 to 16:00 drinks are buy one, get one free. If you’re really counting your satang but want to stay eating beachside, be sure to... Read our full review of Green Chili . Come in the morning for their 125B breakfast buffet or come hungry after the beach for one of their sandwhiches or pastas. Dinner entrees like pork spare ribs or grilled swordfish come with sides and a trip to the soup/salad bar (starting at 295B). 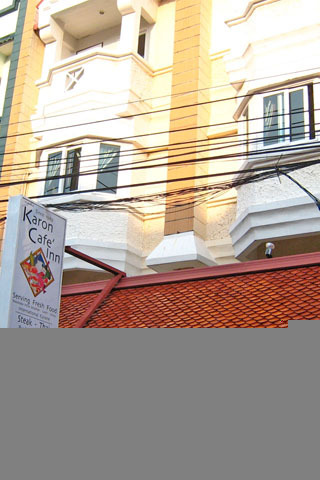 Long running and popular this is one of the more solid eateries in the area and the terrace makes for a good people watching... Read our full review of Karon Cafe .